Diwali is that time of the year when you indulge in things you normally don’t do and to top it, I have inherited Mother’s irrepressible need to make something exotic each Diwali. Every year she would make all the absolute essentials such as ladu, chivda, shankarpali, chakli, et al, but she would come up without fail with a distinctive showstopper for the Diwali pharal (breakfast) that would remain in her guests’ and our minds for a long time. I can’t forget her spectacular Gujarati moong-gotey- spicy mint stuffed baby potatoes, coated with a soaked moong dal batter and deep-fried to perfection. She had made rose petal and rava laddus when it still hadn’t become a fashion to clutter everything from decorative brass troughs to food photos with rose petals. Or for that matter, her baking karanjis at a time when ovens weren’t permanent fixtures in most middle class households. So it was in this quest for that “something different” that I thought of gond laadus! There is something very mysterious and unattainable about gond laadus. It’s the scarcity principle at work here – a product is coveted and in demand if it is restricted, limited, or inventory is extremely low. 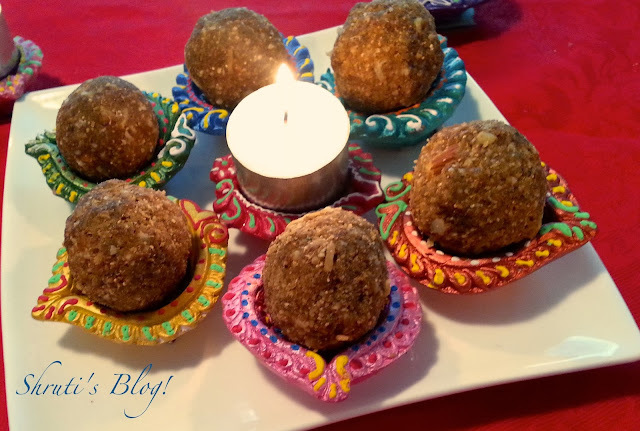 As kids, we would be very unreasonably rationed one laddu whenever these laddus were made for a new mum undergoing postnatal confinement in the extended family. This was one treat that mothers could “hand over their heart”- without batting one compunctious eyelid - deny their kids. For the otherwise doting matron, this wasn't a delicacy to indulge your child; it was a health supplement for one of her sorority who had this only opportunity to eat well and rest a bit while she healed. For one, the stuff that goes into these laddus was prohibitively expensive and not always easily available. Then, these laadus were thought to be very “heat inducing” and thus unsuitable for regular consumption (by this I mean what would have been “regular” consumption if we had been allowed unrestricted access). On a lighter note, I think the most demanding and difficult task was that of keeping those laddus from marauding kids and men folk. I remember one neighbouring aunty sharing her clever tricks of hiding the dabba of laddus inside other larger dabbas or inside the flour bins and changing the hiding place of the laddus everyday. But seriously, it simply wasn’t the norm in an average home to indulge in such luxuries so impulsively, so rampantly. Then making these laddus was not a very easy task too, what with such involved preparations of buying the best quality, purest acacia gum, sourcing the purest marking tree nut kernels (godambi in Marathi) and the sweetest and plumpest of dried fruit and nuts and seeds. The cold larder preparations were equally onerous– with the lynching of the dried dates, the shelling and hand pounding of nuts, the sourcing of the ghee which had to be made of cow’s milk – light, fragrant, yellow and grainy. When it was my time to eat these laadus with abandonment, I was both too overworked and too stressed to eat these. And yes, postpartum weight gain did weigh heavily on my mind. Over the years I have made many heirloom dishes for my girls to learn about them and had made these laadus for the first time a couple of years ago. Some of the remaining gond and kharik had patiently waited in banishment in the furthest corner of the pantry to return to favour. The rest of the ingredients were available at home. Gond laadus it was going to be this Diwali. How easy was that! But good things don’t come so easily and certainly not without a contest, do they? Recent admonishment by my GP has made me introspect about sugars and fats of another nature and description. How on earth was I going to make gond laadus notorious for their calorific excesses and sweet and unctuous treachery? Bingo! That’s the exoticness I have been looking for. That’s the show stealer- the showstopper challenge of my Diwali preparations. What ensued were perfect, lower calorie, enhanced nutrition Spelt Dinakacha Laadus. My daughter has been trying out alternate foods in her quest to eat healthier. She recently introduced me to Spelt, a delicious and nutritious ancient grain with a deep nutlike flavor. It’s a cousin to wheat, but offers a broader spectrum of nutrients compared to wheat. It is an excellent source of vitamin B2, a very good source of manganese, and a good source of niacin, thiamine and copper. It’s great cholesterol-lowering properties make it good for cardio-vascular health. Another of the daughter’s discoveries is coconut sugar (not palm sugar). It's sugar made out of the sap of the coconut tree. It has become quite popular recently as a low calorie substitute for sugar for it has a Glycemic Index of 35 compared to the GI of refined white sugar (60) and brown sugar (64). Its caramely jaggery-like taste meant it was a perfect fit on the flavour front. The selection of olive oil to shallow fry the edible gum and roast the spelt flour was an adventure that paid off well. So ladies and gentlemen, presenting the showstopper - Spelt and Gond laadu! Transfer the pieces in a microwave proof dish and pop it in a microwave for a minute or so. Remove and cool the pieces thoroughly. This helps to dry the dates even further and facilitates the grinding. Heat a kadhai and lightly toast the poppy seeds and remove them onto a plate. Then lightly roast the nuts in the same kadhai and keep aside. Toast the desiccated coconut lightly and set aside. Lightly roast the almonds and the cashews as well and set aside. Heat about a tbsp of the olive oil in the same kadhai and add two tbsps of the edible gum and pan-fry until gum puffs up and changes colour. Take care not to burn the gum. Repeat this with the rest of the gum crystals adding more olive oil, till all the gum is fried. Set aside to cool. In the same kadhai, add the rest of the olive oil and roast the wholemeal Spelt four till it lets out a heavenly aroma. Set aside and cool. Keep a tbsp of the toasted poppy seeds and an equal measure of the toasted coconut aside, so you can mix it into the mixture to introduce some texture. Grind the kharik bits into a crumbly mixture. If the bits grind unevenly, sieve the ground mixture through a large holed sieve so you get uniform meal. Remove into a large mixing bowl. 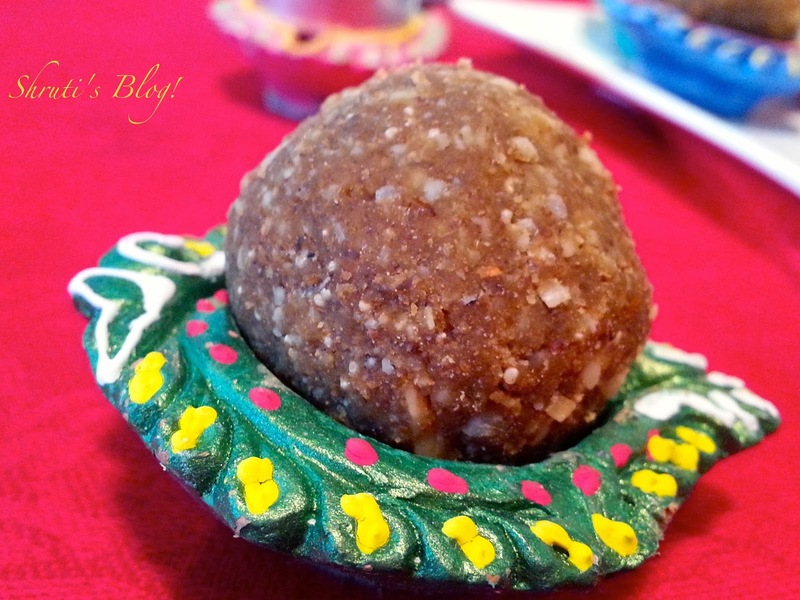 The kharik will lend sweetness to the laddus as well. Reserve some of the cooled fried gum puffs aside, again for texture, and whiz the rest in the mixer or crush in a mortar and pestle. Remove into the mixing bowl along with the kharik meal. Mix the nuts, coconut and poppy seeds and whiz the mixture through a grinder and remove in the mixing bowl. Prepare the coconut sugar syrup in a heavy bottom pan by adding the sugar and a little water. Bring it to a boil. Continue cooking until the syrup turns sticky. It was hard to tell the “string consistency” of syrup made with coconut sugar and I was making it for the first time, so I just went by my gut feeling. In any case, we need the syrup only to bind the nuts and flour mixture. Turn off the heat and add the powdered ingredients, roasted Spelt flour, the reserved whole gum puffs, poppy seeds and toasted grated coconut. Add cardamom and nutmeg powders. Add a tbsp of ghee for the flavour. Mix well. 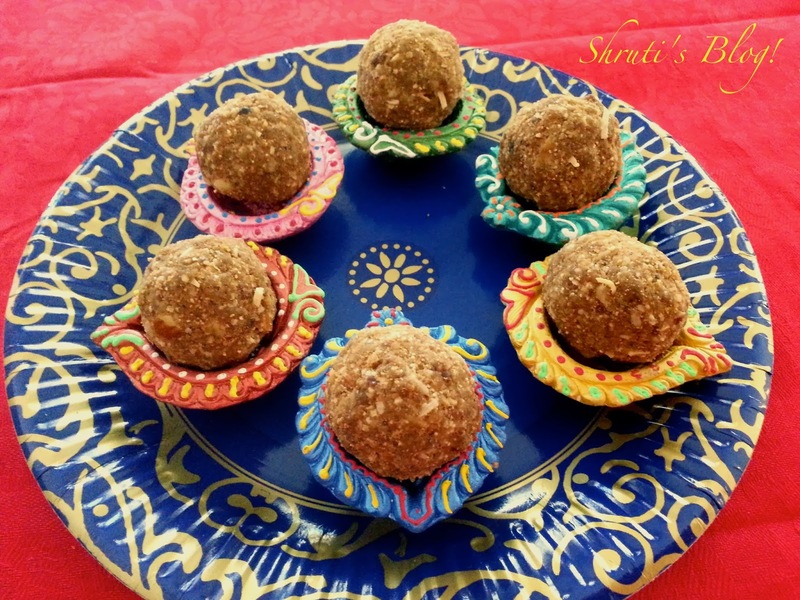 When the mixture cools a little, shape them into small balls or laadus. Loved reading it!This definitely is a heirloom dish! Am new to spelt and this is a recipe I need to try! Shrutitai, you can get rid of the oil by 'microwaving' the dinka for 30 secs :-) It puffs up just as well and just as easy to powder. I have done it that way several times now! !